Thoughts, ideas, emotions, feelings and brainwaves are moving around in your mind every single second of everyday. These flows of electrical waves allow neurons within our brain to communicate with each other while we walk, talk, think, work and feel. Where they are generated in your brain and how they communicate with each other is still somewhat of a mystery. 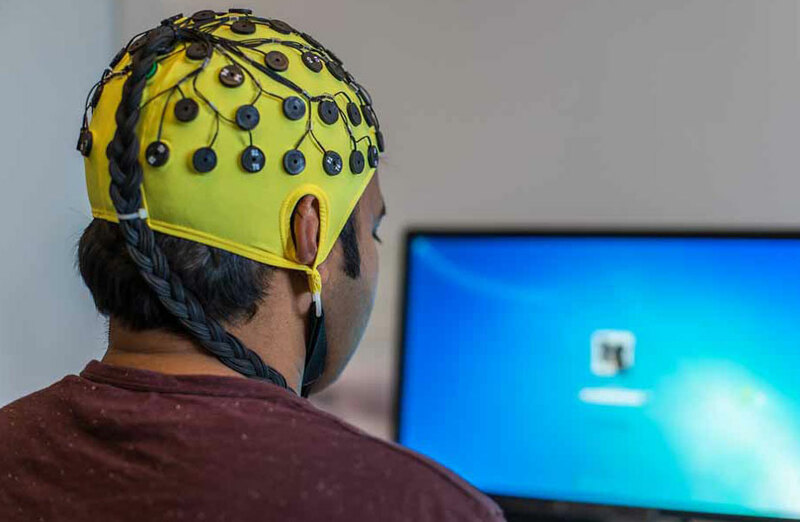 As research continues and we uncover and find answers to these questions, one thing is sure, and that is, brainwaves are the foundation of everything going on in our minds, from memory to attention, from intelligence to emotions even the way in which we behave at a given moment. What do these Brainwaves look like? Brainwaves (left) in neuroscience refer to the rhythmic changes in the electrical activity of a group of neurons. Each neuron has an electrical voltage, when these neurons fire at the same time because of stimulation from another cell we see changes in the form of a wave. At any one time, a number of these waves are sweeping through our brain, each one producing a different frequency, grouped together and classified as Beta, Alpha, Theta and Delta and Gamma each associated with a different task. Ongoing research has shown that a specific type of brainwave pattern would indicate that you are in a particular state of being. 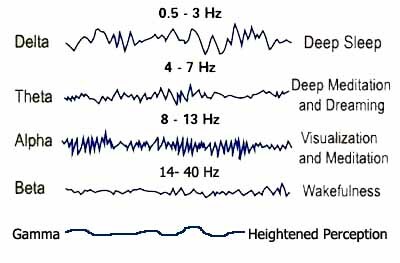 If an EEG reading shows you’re emitting 10Hz signal that would indicate a relaxed and deeply chilled state. If however you were emitting a 1Hz signal, there is no doubt about the fact that you are in deep restorative sleep. There are other patterns that can be seen. Those people who are generally in a good mood and are motivated and enthusiastic normally have high serotonin levels, which are normally released by a 10Hz frequency. Others who experience flashes of inspiration, creativity and ideas are often in very specific alpha frequencies. Those who seem to have high focus levels are found at the 14Hz level. So it’s clear that we can understand what is happening inside our brain when these different states are present, when we are asleep, focused, full of energy and happy or when we are being creative and inspiring. Well, brainwaves are more than the result of being in a particular state; it also determines your state. In a nutshell, the frequencies emitted by your brain will contribute to your state of mind, for example, when you feel excited, focused, happy, relaxed or intuitive and creative. If you could change your brainwave patterns, you could also change and reproduce a particular state of mind. If you think about it, you will notice that you are already doing it. 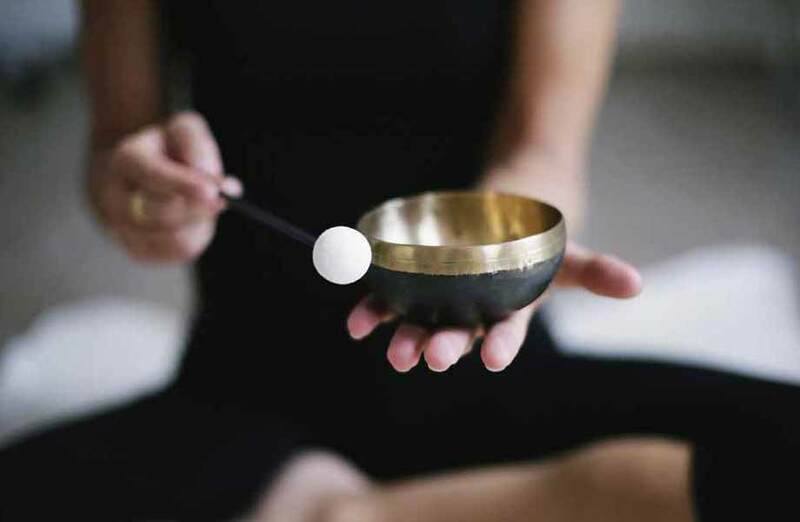 Simply by listening to relaxing music, you are effectively controlling your brainwaves, by listening to the music you are moving the brainwave patterns from beta to alpha. Imagine the possibilities if you could control your brainwaves to produce the exact frequencies needed for the precise states of mind mentioned above? Wouldn’t it be great if you could place yourself in a state where you are able to become more focused and purposeful or maybe you need some inspiration for a presentation that you have to give, maybe you would like to be able to relax on a deeper level, or just be able to have a better night’s sleep? It’s called “Brainwave entrainment”(BWE) for short – it’s a branch of science called neuroscience that has been studied for over 50 years. Today it’s becoming a more and more understood subject, and is purportedly used in many therapeutic situations, for the treatment of numerous psychological and physiological conditions.